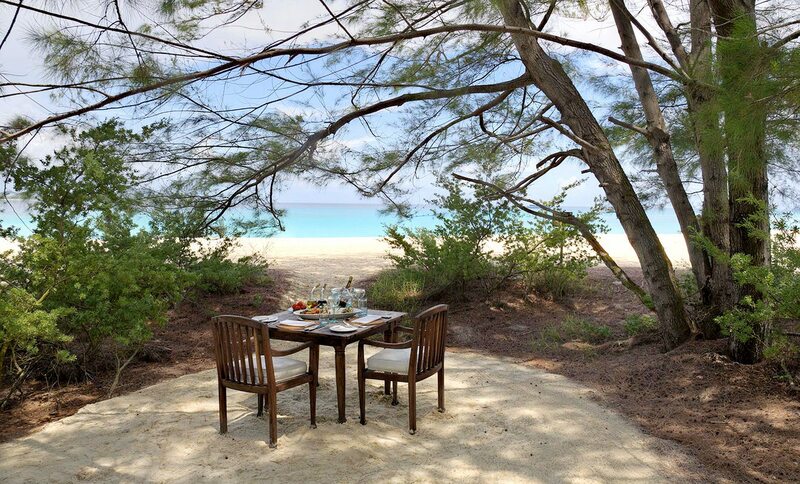 We sit at a private, lantern-lit table right on the beach, lulled by the sound of the waves tumbling onto the sands. The gentle light of the moon casts everything in a warm, silvery light, shimmering on the ocean surface. 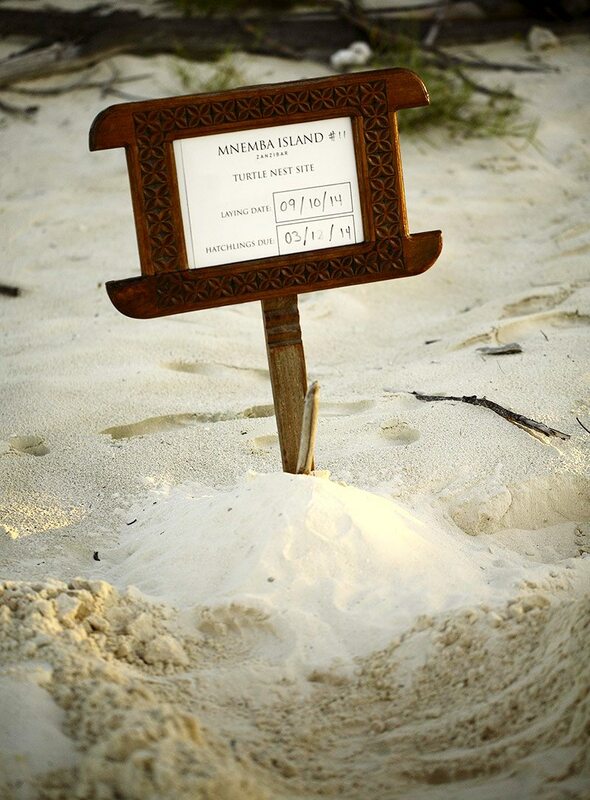 It’s hard to believe that several days have already passed on this private island off the north eastern tip of Zanzibar, which is just 1,5km in circumference. 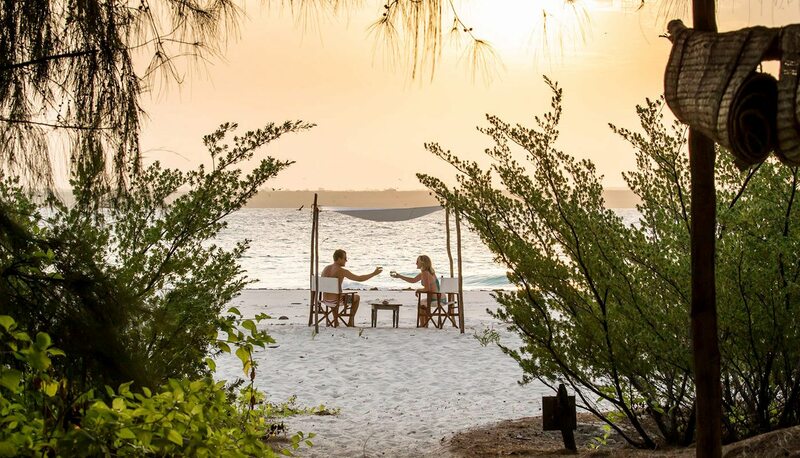 Surrounded by powdery white sands, turquoise beaches and superb coral reefs such as the Mnemba Atoll (famed for its diving), Mnemba Island is imbued with romance. 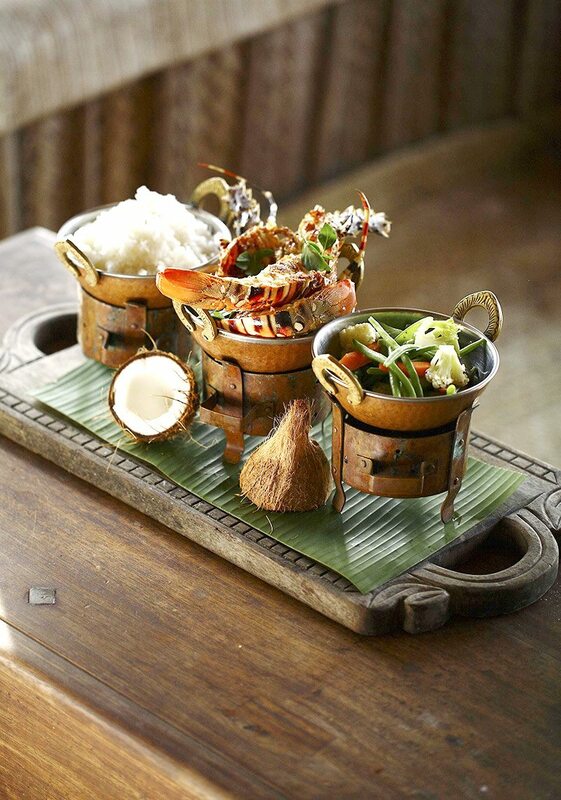 After a deliciously fresh seafood dinner, it feels too soon to return to our beachside banda, one of just 11 on the island. 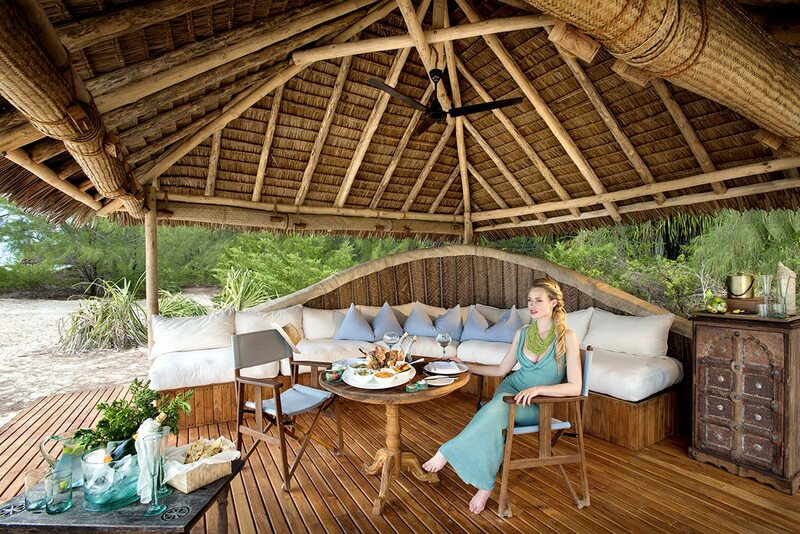 We walk barefoot in the powdery white sand to the lodge’s makuti-thatched bar and dining area for a drink. Lazing on traditional Zanzibari loungers with cocktails in hand, we discuss tomorrow morning’s deep-sea dive, our first after completing a dive course at the lodge’s on-site dive centre. Mnemba beaches are a nesting spot for endangered green sea turtles, so there’s a good chance of spotting one, along with three species of dolphin, which we can swim with!The night air is balmy, tempting us to go for a moonlit swim. Just a few steps and we’re plunging into the ocean’s sultry depths. Spots of light flicker in the water – we’re astounded to realise it is phosphorescence! With every movement thousands of green sparks trail us, illuminating the sea around us like glow worms. 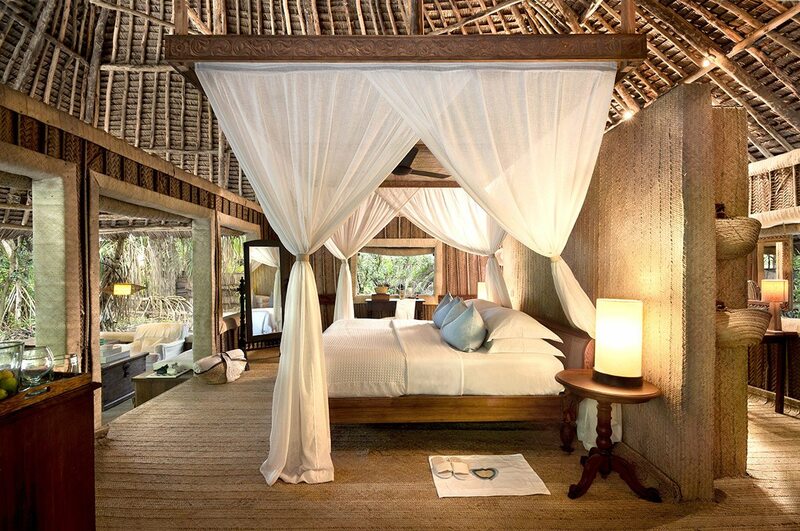 Then it’s back to our open-air suite to wash off the salt in a hot shower.Everything inside our room is earthy: whites, rattan and wood – each suite has been constructed using local, traditional methods. 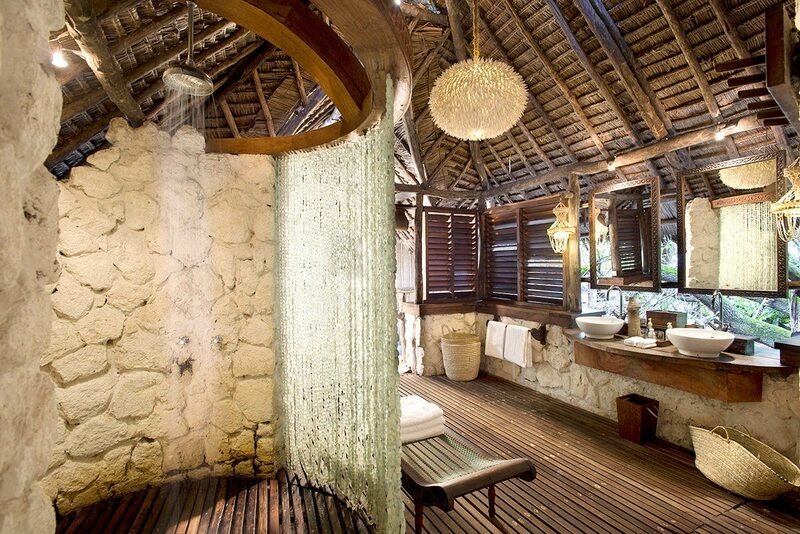 We step into the shuttered bathroom that continues the theme – slatted wood ceilings with makuti thatch roofs; stone-walled toilet and shower; and hand-woven mats made from palm leaves.Pushing aside the huge glass-beaded shower curtain, we step into a powerful stream of hot water. Once refreshed, we cuddle into the bed, which is adorned with an intricately detailed carved wooden headboard and comfortingly soft white linens. We drift off to sleep to the sound of the ocean playing its infinitely soothing lullaby. After a deliciously fresh seafood dinner, it feels too soon to return to our beachside banda, one of just 11 on the island. 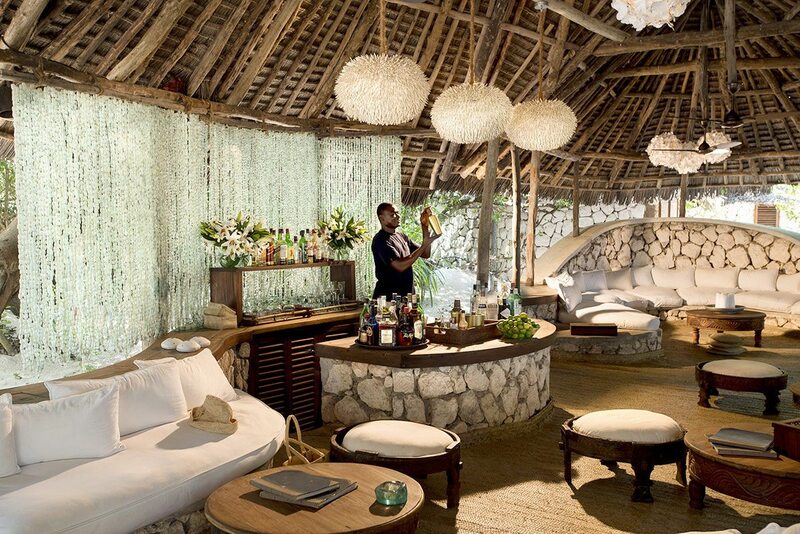 We walk barefoot in the powdery white sand to the lodge’s makuti-thatched bar and dining area for a drink. Lazing on traditional Zanzibari loungers with cocktails in hand, we discuss tomorrow morning’s deep-sea dive, our first after completing a dive course at the lodge’s on-site dive centre. Mnemba beaches are a nesting spot for endangered green sea turtles, so there’s a good chance of spotting one, along with three species of dolphin, which we can swim with! The night air is balmy, tempting us to go for a moonlit swim. Just a few steps and we’re plunging into the ocean’s sultry depths. Spots of light flicker in the water – we’re astounded to realise it is phosphorescence! With every movement thousands of green sparks trail us, illuminating the sea around us like glow worms. Then it’s back to our open-air suite to wash off the salt in a hot shower. Everything inside our room is earthy: whites, rattan and wood – each suite has been constructed using local, traditional methods. We step into the shuttered bathroom that continues the theme – slatted wood ceilings with makuti thatch roofs; stone-walled toilet and shower; and hand-woven mats made from palm leaves. Pushing aside the huge glass-beaded shower curtain, we step into a powerful stream of hot water. Once refreshed, we cuddle into the bed, which is adorned with an intricately detailed carved wooden headboard and comfortingly soft white linens. We drift off to sleep to the sound of the ocean playing its infinitely soothing lullaby. 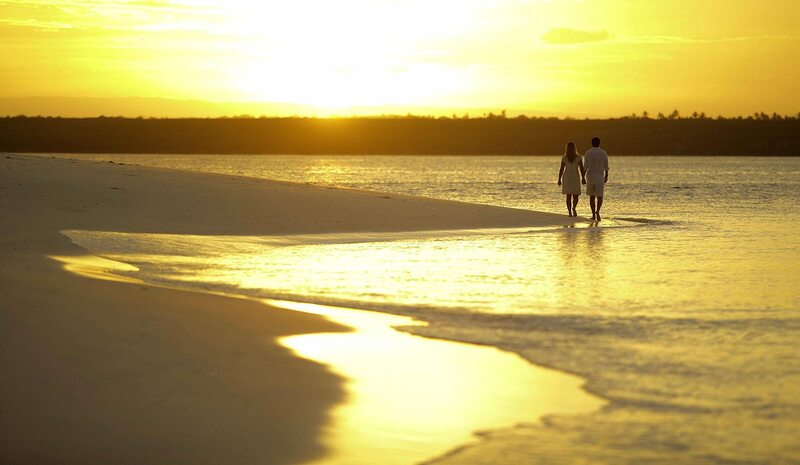 Mnemba Island Lodge is the most romantic place I can imagine. We’ve been living out a Robinson Crusoe-like fantasy of being stranded on a deserted island, while still in the lap of luxury. Mimicking our private butler, we’ve even been walking barefoot everywhere we go.With its own dive centre and two dedicated boats, we can take to the waters whenever it suits us, and this is flexibility is echoed in the impeccable service and dining options. 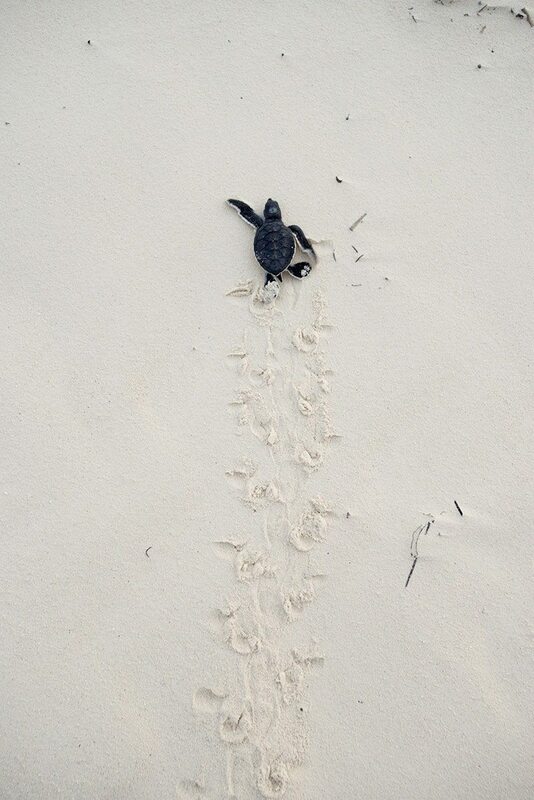 We’ve enjoyed all this, along with the incredible experience of seeing green turtles hatching on the beach – a credit to the conservation efforts on the island. 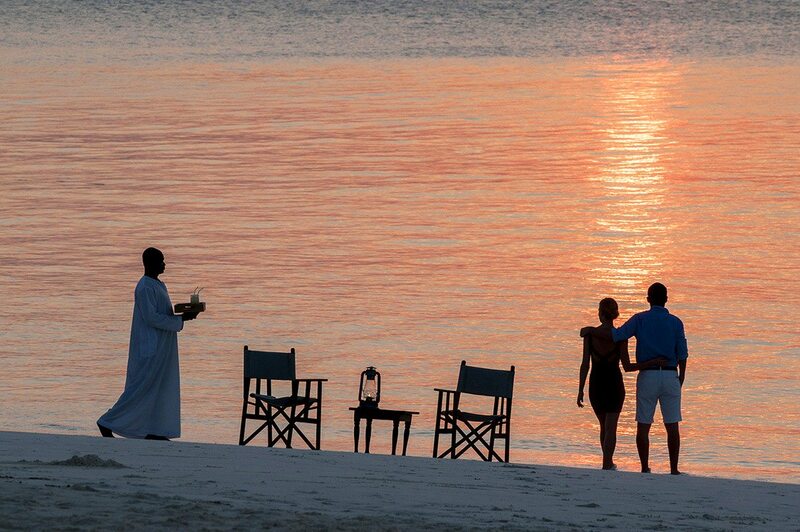 Mnemba Island Lodge is the most romantic place I can imagine. We’ve been living out a Robinson Crusoe-like fantasy of being stranded on a deserted island, while still in the lap of luxury. Mimicking our private butler, we’ve even been walking barefoot everywhere we go. With its own dive centre and two dedicated boats, we can take to the waters whenever it suits us, and this is flexibility is echoed in the impeccable service and dining options. 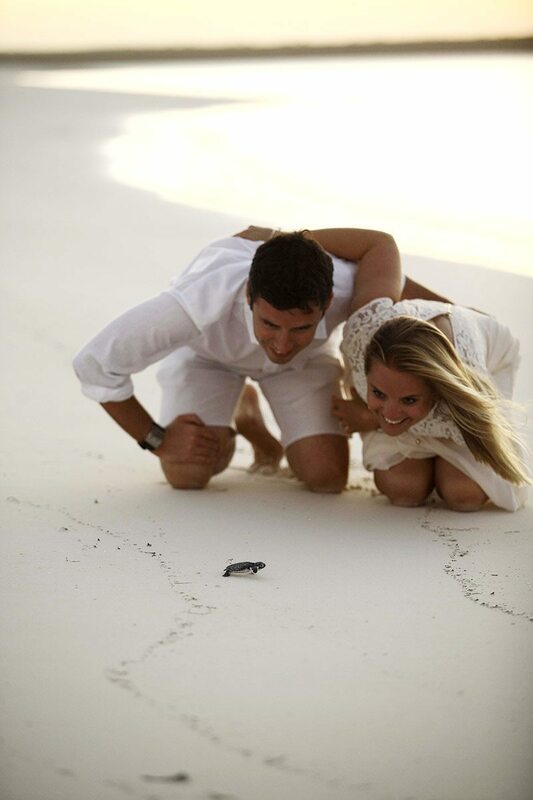 We’ve enjoyed all this, along with the incredible experience of seeing green turtles hatching on the beach – a credit to the conservation efforts on the island. 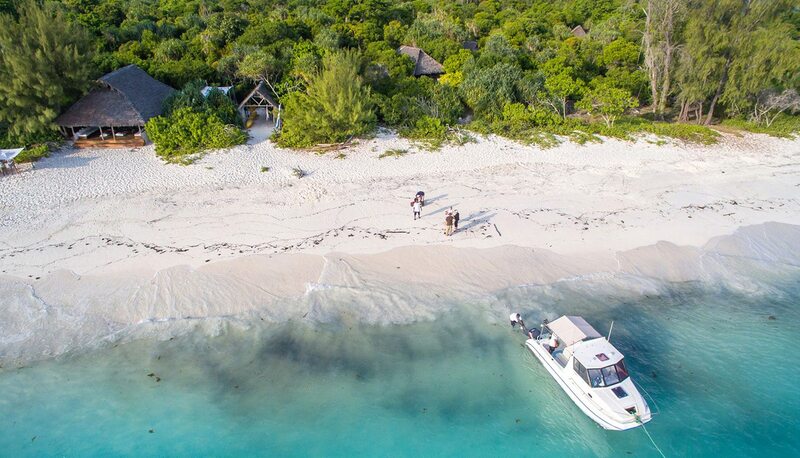 Private island getaway with 11 guest bandas tucked into a tropical forest in a marine conservation area and endangered-turtle breeding ground. 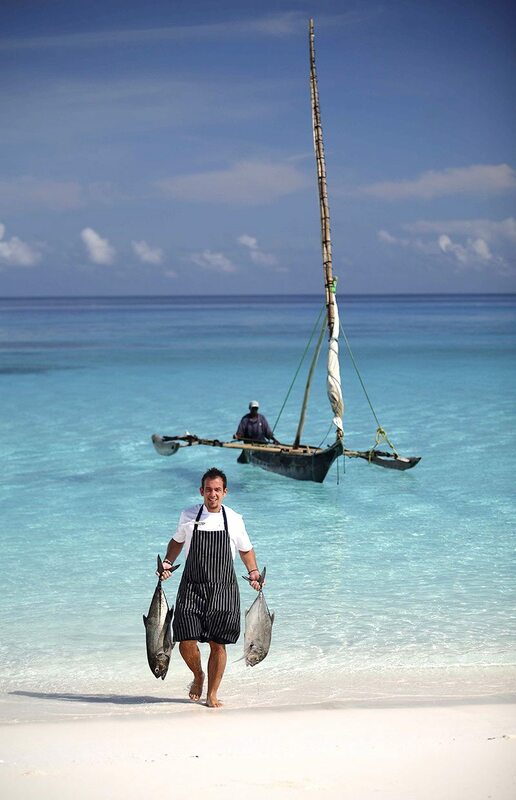 Private island, conservation area, private butler, private dining, beach picnics, customised meals and flexible schedules. 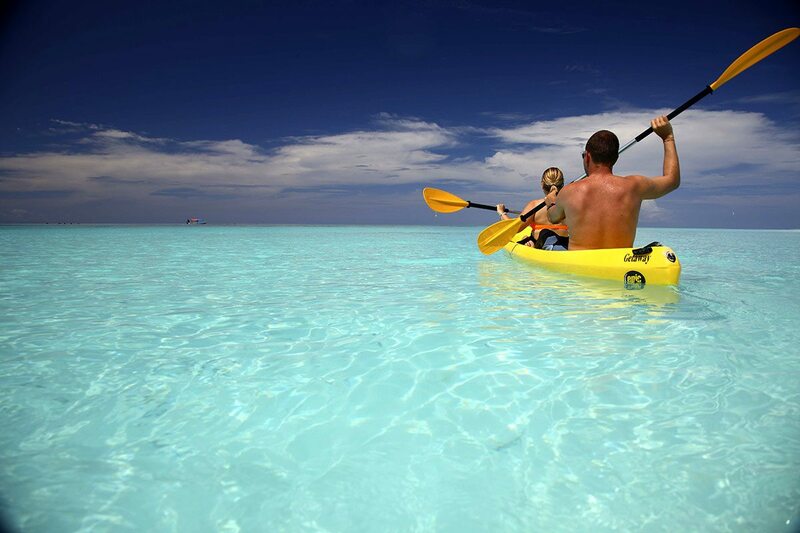 Swimming, watersports, snorkelling, diving, Padi dive courses (additional cost), dhow cruises, birdwatching and walking. 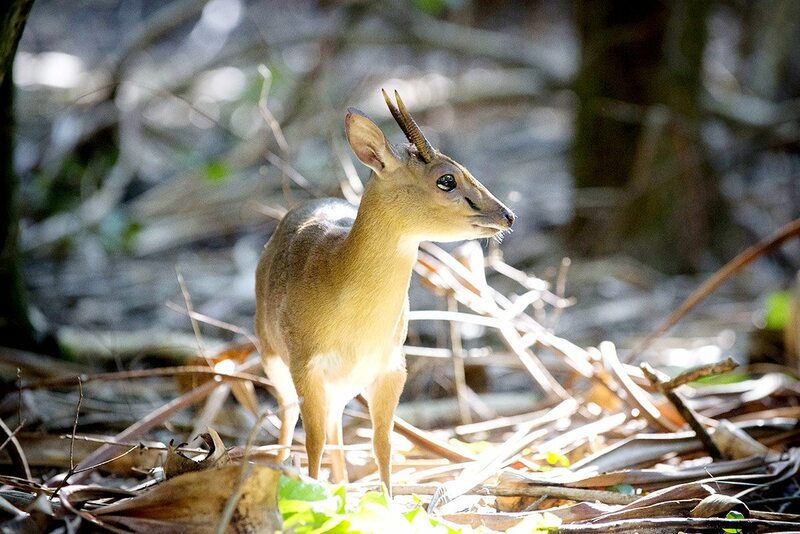 Children of all ages welcome, with family banda, babysitting services (additional cost) and WILDchild programme. 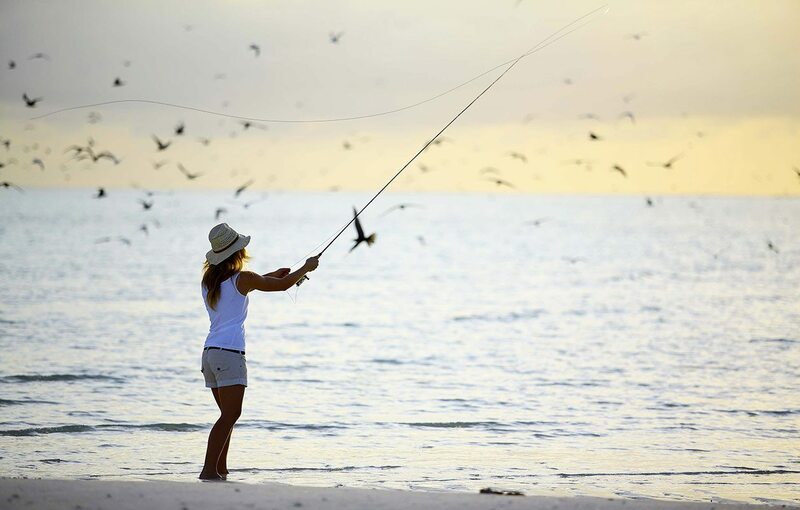 With the exception of the occasional shower, you can expect clear skies and sunny weather in Zanzibar and Pemba now – perfect for the beach. 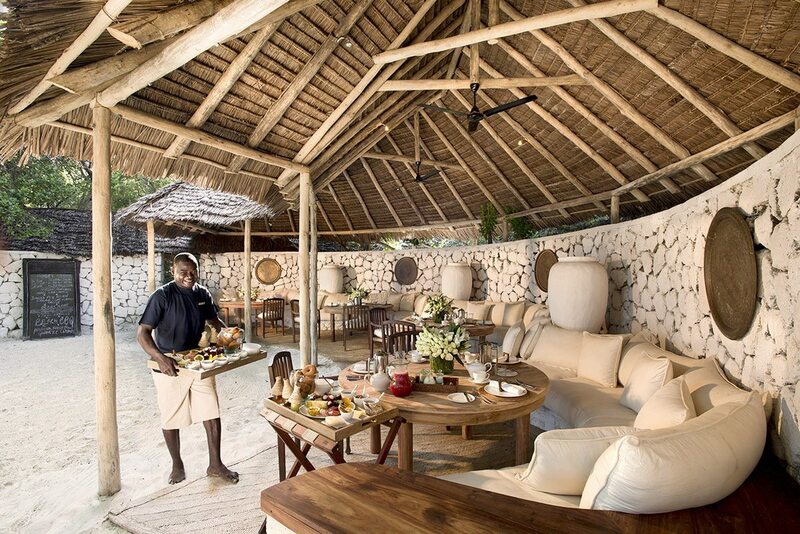 The Zanzibari architecture of many of the lodges ensures they are cool and airy inside. If you want to immerse yourself in the life of the coral reefs, the diving is particularly good on the north coast in July and August. If you’d like to take in herds as well as schools, combine your trip with a visit to the southern Serengeti now to see the Great Wildebeest Migration. Between the short rains and the long rains, Zanzibar experiences a hot, dry season, and temperatures typically reach the low to mid-30s. While March is especially hot and humid in Zanzibar and Pemba, the scuba diving is very good along the southern coast during this time. To witness the wildebeest calving season, pair your beach holiday with a trip to the southern Serengeti now. My travel philosophy is definitely never say never, but occasionally even I have to concede that however wonderful a destination, there are some times of the year when you won’t experience it at its best. 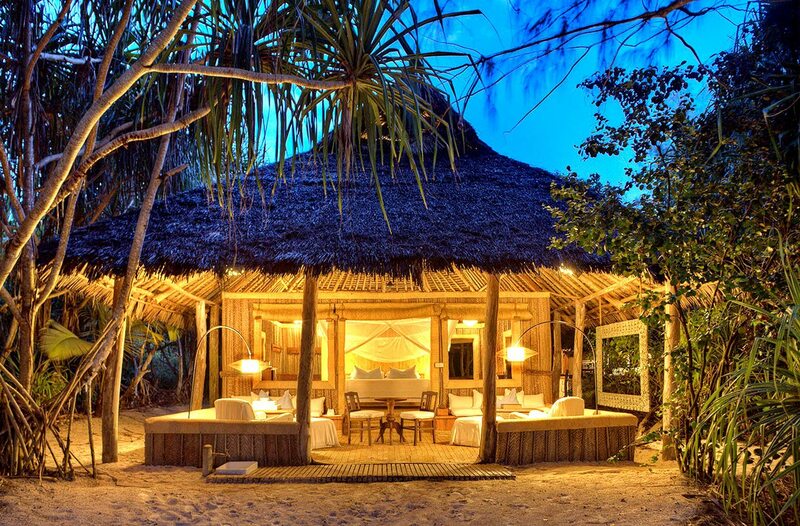 April and May in Zanzibar are a case in point – the heat and humidity make these months impossible. 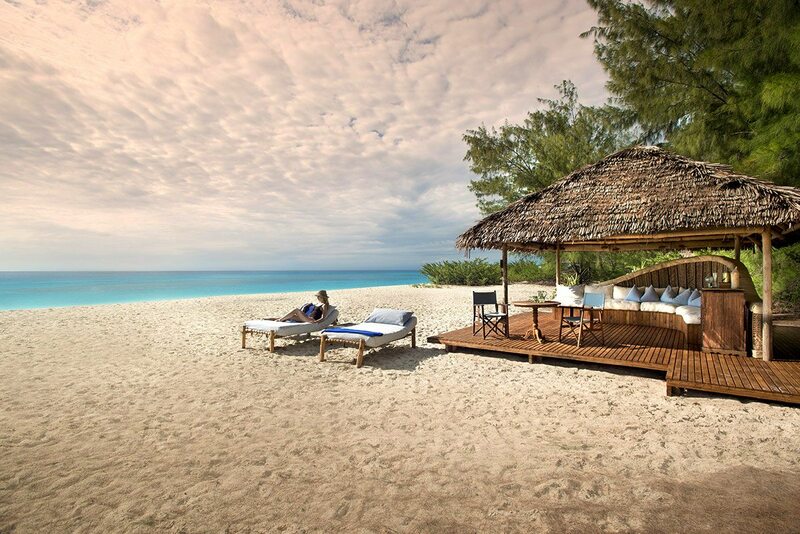 Although it also rains in November, this is a much more pleasant time to be on Zanzibar as typically only light afternoon showers are experienced, and the humidity is not excessive.